This Patch will solve Mac OS X Lion 10.7 incompatibility of Portable Applications due to CocoaDialog PowerPC binaries inside app bundle. 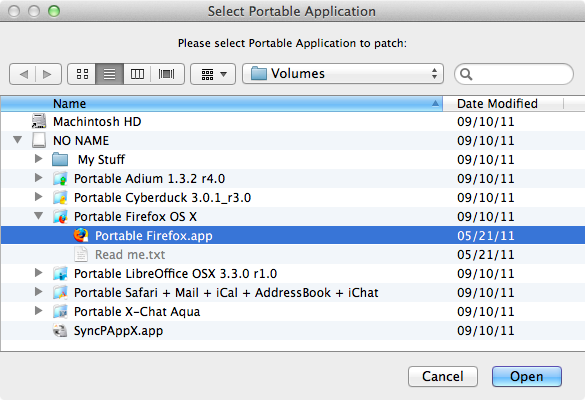 Portable AddressBook, Portable iCal and Portable iChat are not Lion compatible. Select your Portable App to patch and click Open. Once done you can Pacht more… apps or Quit. Donate button will open FreeSMGU - FreeSoftware Mac User Group fundraising web page. Your donations to support our annual site hosting costs are welcome. of FreeSMGU - FreeSoftware Mac User Group are welcome. PAppsLionPatch script source code page.